This mystery ended up on my winter list after my sister wanted me to do a reading challenge with her. One of the challenges is to read a book whose author has your first name. Not many authors have my first name. When I first searched at Amazon, one name came up with plenteous books, but I wasn’t about to read any of those! (Today when I search, such an alternate group of books appear than before. Showing up now is a Janie DeVos, a women's southern fiction writer. I might need to look into her books.) Searching a bit more, I found this first of a series. Such a short mystery took me much longer to finish than anticipated, probably because it was a bit predictable and simple, and I wasn't motivated to press on. 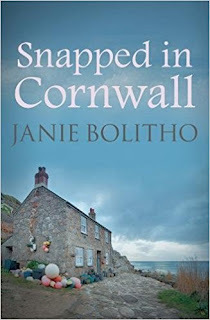 I've always enjoyed reading works set in England, and Cornwall is a picturesque favorite. In fact, the cover of my edition is inviting. I also enjoy learning, rather, trying to remember, the local lingo. Early in the book, the protagonist Rose fixes a "doorstep sandwich" containing cheese and salad. Unfamiliar with what a doorstep sandwich is, I coveted one when I found out. More or less simple, it is thick cut farm bread with meat and / or cheese topped with lettuce and tomato. Sounds much like our sub sandwiches, but when you think of "thick cut farm bread" . . . well, oh, yum! Doorstep sandwiches would make a filling lunch. Called doorstep, it is because the bread is cut as thick as a doorstep. Beside the sandwich curiosity, I marked one word I was not familiar with: "soughed." A slight breeze lifted her hair and soughed through the grasses behind her. Pronounced sou, it means to moan, murmur, or rustle.